I’m in! 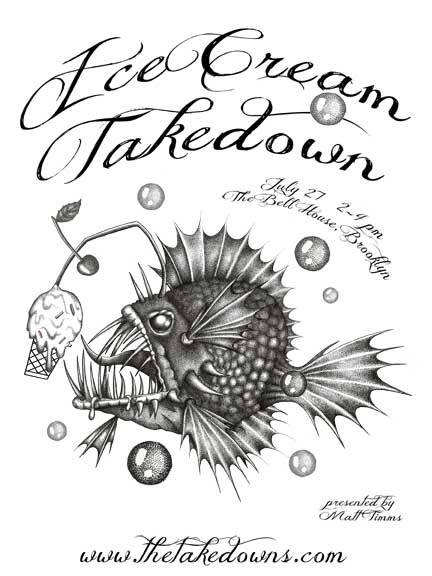 Come see me compete in the Brooklyn Ice Cream Takedown on July 27th! This is a quick post to let you know that I’m competing again in the Brooklyn Ice Cream Takedown on July 27th at the Bell House from 2-4pm! Last year I had so much nerve-wracking fun making my Backwoods Blueberry Buttermilk Sherbet that I have to make something else just as crazy this year. It’s hot, steamy, and sticky out there and when the weather is this gross, is there anything better than ice cream? So please come out and let me feed you! As always, there are only a limited number of tickets available. Once they are gone, there are no more! I will sling sorbet and smize with my eyes 😀 ! The Koala and I would eat all of NY. We’ve always figured that he would enjoy NY eating while I’ve always wanted to eat NOLA. We used to be huge fans of ANTM back in the day. As was Tofu. He is the master of the smize, though I’m not sure if he can smize with 1 eye now. I guess it’s a permanent wink. You both would have so much fun in America! I know one day you will eat here and one day, I will eat tons of yummy seafood in Auckland! I totally think you can smize with one eye. Think how devastating Tofu would be: pirate patch on one, smizing with the other 😀 ! How is his recovery, btw? They don’t make glass bunny eyes, do they? I wonder how many kilos we will gain after an USA eating holiday? No glass eye for bunny, they sewed it up to prevent infection. I don’t know of bunny glass eyes, but a co-worker said she knew a cat who had his eye removed and a button was put in place. Tofu is way to badass for a button. Tofu is way too badass for a button. Although a button would be reminiscent of those home-made soft toys, wouldn’t the idea of a cat with a button for an eye be super creepy? I wonder if Tofu would wear a stick on goggly eye for shits and giggles? Ha! I would try it and see! Don’t forget you need to freeze the bowl. Didn’t that happen to you last year? I sort of remember some freezer drama. Make sure your neighbors have freezer space for you to borrow too in case you need it. Do you have an idea of what flavor you will be making? I was in Wegmans the other day buying ice cream for the hubband (blueberry swirl) and noticed they now sell wine ice creams. The Chocolate Cabernet caught my eye. I didn’t but any yet though because I knew I didn’t have room in the freezer for two containers of ice cream. Maybe next time. YES! You remembered! Last year I was so cavalier about freezing the ice cream maker bowls that once I realized how much time it took to freeze them rock solid, I was almost out of time. This year I will be better! I have a few ideas for flavors. Two in the running, both will be tart and fresh. Wine ice creams are yummy but the alcohol makes them hard to freeze. If you try the Chocolate Cabernet flavor, let me know what the texture and the consistency is! Thank you, Lucas! I just hope it’s edible! Good luck! This sounds like fun! Thank you, Chef Mimi! I think the hardest part is trying to decide on a flavor. Right now, I have it narrowed down to two!